Released April 2007. The new M mount 21mm f/4 P has the same optics as the previous screw mount 21mm f/4, but now sports a new lens barrel. 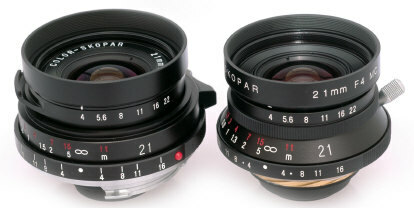 Produced primarily for the new Voigtlander R4's, the 21mm f/4P is not sold with a viewfinder as there is no need of an accessory 25 viewfinder for the R4A or R4M. 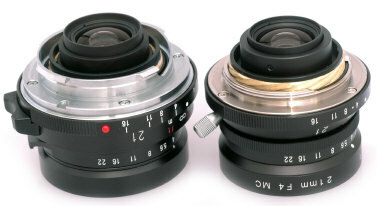 The 21mm f/4P in Leica M mount lens brings up the 28/90 framelines in Leica M cameras. The 21mm f/4P is styled similar to the Leica 35/2 pre-aspheric Summicron. The optional square LH-1 lens hood will fit the 21P, but the LH-1 is not suitable for the R4's as it blocks too much of the viewfinder. The lens is supplied with a 39mm snap on front lens cap.